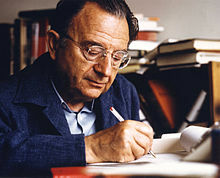 Erich Seligmann Fromm (23 March 1900 in Frankfurt – 18 March 1980 in Muralto) was a German-American social psychologist, psychoanalyst, and humanistic philosopher. He was part of what became known as the Frankfurt School of critical theory. He taught at several universities. Fromm was born in a family of Rabbis. Because of his Jewish background Fromm fled from Nazi Germany in 1934 and settled into the United States. After the war he moved to Mexico. The last years of his life he lived in the Swiss Alps. He died 1980 in Muralto. One of his famous works is "Haben oder Sein" from the year 1974, in this book he critices many aspects in the western society like the pursuit of wealth. www.erich-fromm.info - German site - Curriculum vitae and available books. This page was last changed on 8 October 2017, at 18:50.